Decorating can be difficult. Debating which chair leg design goes best with your custom dining table is not for the faint of heart. Sometimes we would rather just sit on the floor like little kids instead of attempt to make ourselves comfortable on that hard modern couch or stiff wingback chair. The folks over at Restoration Hardware have come up with a seating solution that is just about as comfortable as it gets, but is still acceptable in your post-college apartment or house. 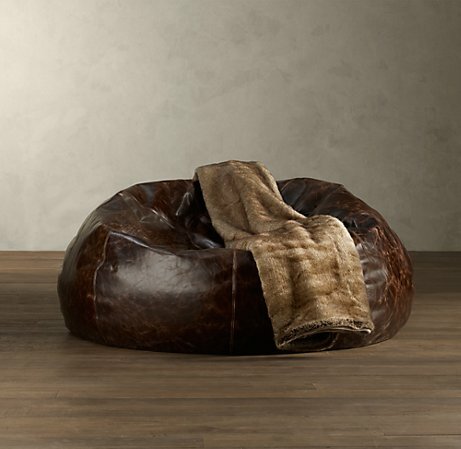 The Grand Leather Bean Bag Chair ($675+) has all the comfort of your bean bag chair from college with the luxurious style of someone who cares about both design and comfort. The ‘chair’ looks like it has just the right amount of sink-into-it room and is available in a wide selection of high-quality leathers and colors. It’s not a cheap addition to your living room or den arrangement, but we’d certainly love to fall into that after a long day’s work.